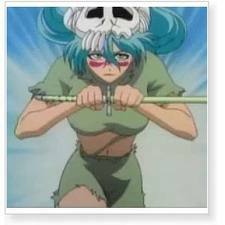 Neliel Tu Odelschwanck is the former Tres (#3) Espada in the anime Bleach. 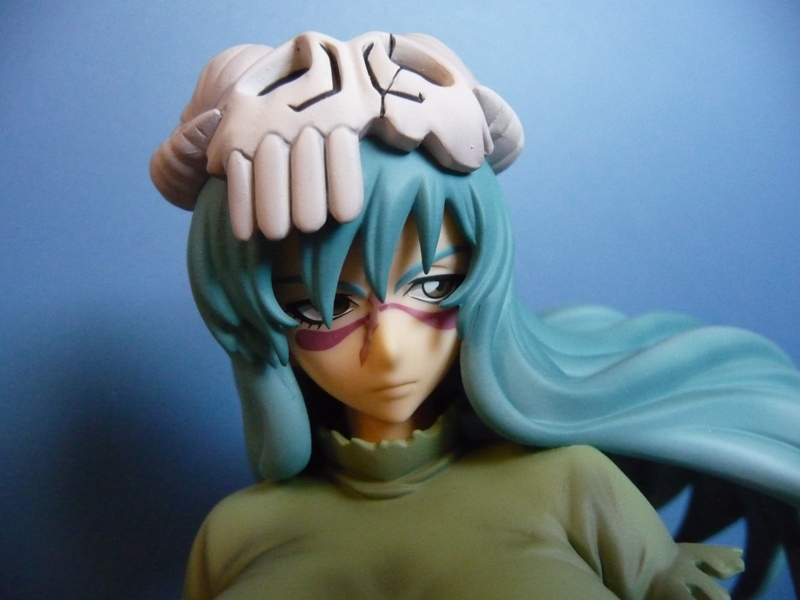 She has two forms; a small childlike from called Nel Tu and her original adult female form Neliel. 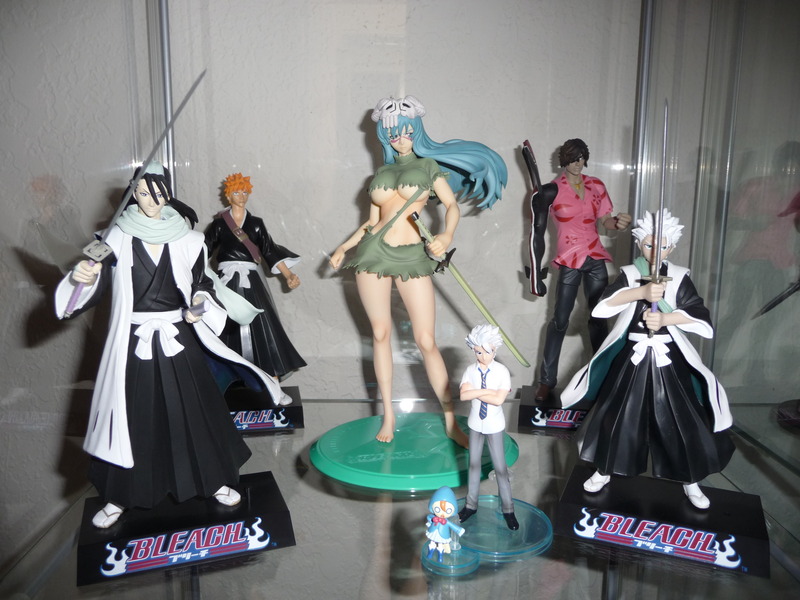 Neliel, even as an Espada, is a pacifist and only like to fight in defense of those she loves. I got this toy at Akon 21 for $80. 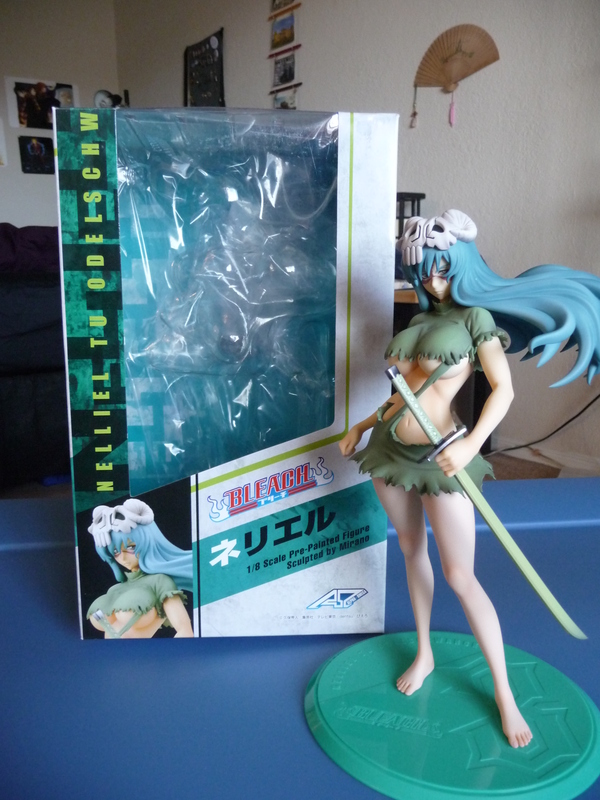 This is the Neliel tu Odelschwanck Bleach figure by Alpha X Omega, and the sculptor is Mirano. This toy was released in 02/2010. 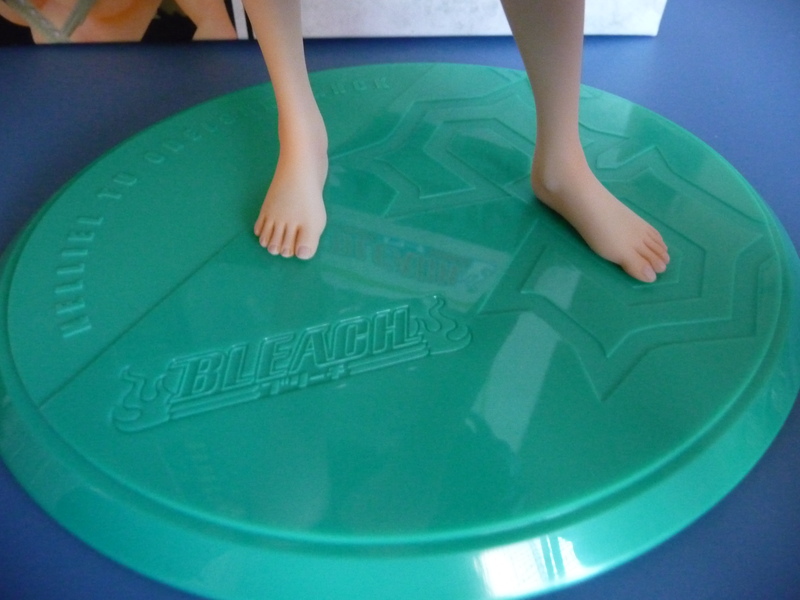 Base: The base is a large turquoise oval. It says Bleach on it and has a pattern in it. 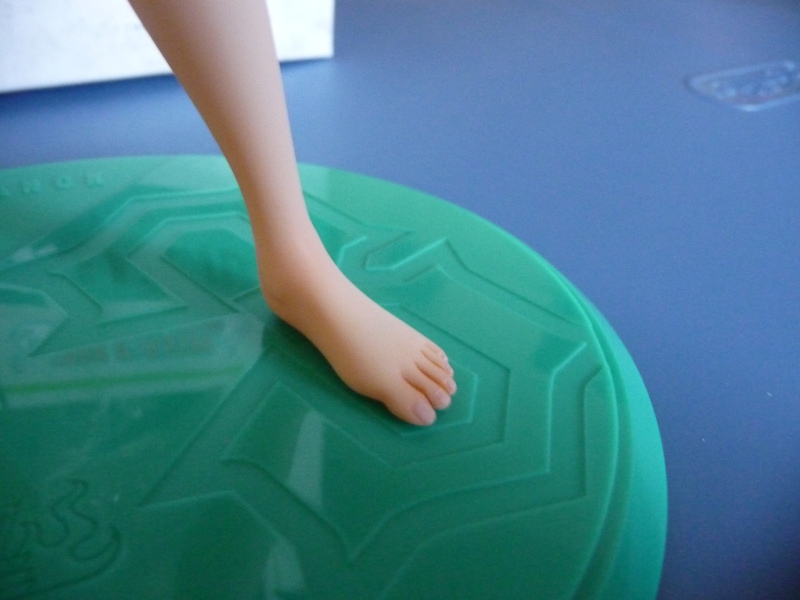 She attaches to the base by foot pegs. I do not like this base because the color doesn’t match her. Her hair is blue and her outfit is green, the base clashes with both. Sculpt: This toy is 1/8 scale and is rather large. She comes with her sword, which is removable from the hand. The sculpt looks excellent, her hair looks dynamic is if it were flowing in the wind, and her outfit (for what little there is of it) has rather detailed rips. She looks like her anime counterpart, and is very in proportion to what is seen in the anime. 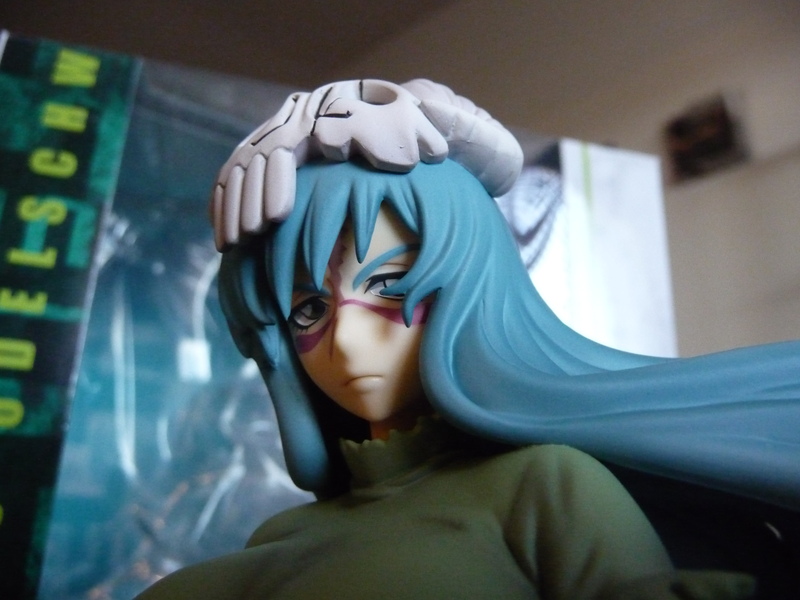 Her outfit is a bit skimpier than in the show, which only adds to the appeal of the figure. Paint: There isn’t much to be painted on this figure. 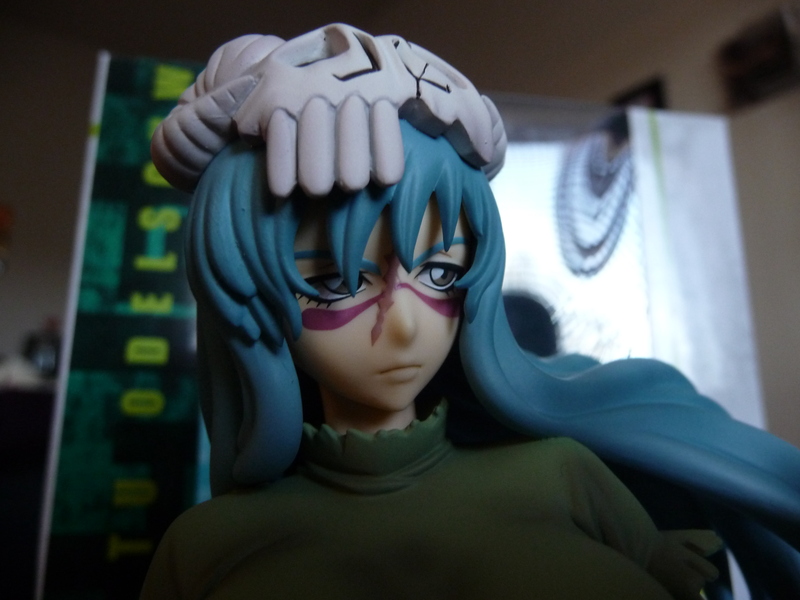 They got the colors on her hair and outfit to match the show perfectly, and her mask is painted nicely also. There are no bleeds and is no dirt on the paint. The shading on her body is also really good, and she even has painted finger and toe nails. Her face also looks excellent, the expression is perfect for her. The large three painted on her back is also painted perfectly. Pose: Her pose seems relaxed but dangerous, like shes about to attack if you make the wrong move. This is a good pose for her and matches her personality well. The one thing i dislike about the pose is that her back is very arched, shes practically leaning back.